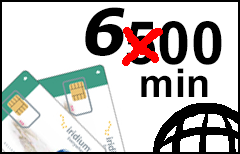 The Iridium 500 600-min Global Prepaid Plan is the most popular choice due to its low start-up cost, reasonable call rates and a generous one-year validity term. Great news! Starting May 1, 2019, this plan will have 100 more minutes included at the same price!